Granada was the last city to be re-conquered by the Catholic Kings in 1492 and Spain’s Moorish legacy is nowhere more evident than in Granada, but also the city of Almeria. 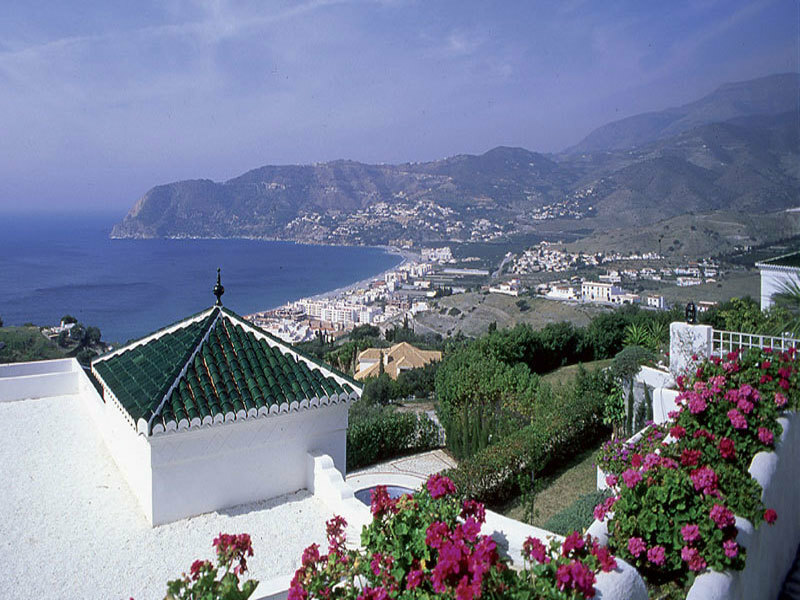 Your base is the coastal city of Almunecar. This is a city whose Phoenician, Roman and Moorish past is still much in evidence. The wonderful sub-tropical climate will help you enjoy the city’s rich artistic and cultural heritage as well as the pretty historic centre. In and around Almunecar the sierras plunge spectacularly into the sea and you will find no less than 25 beaches and coves within the boundary of the municipality. Flight to Malaga and transfer to your hotel in Almunecar on the beach east of the city for seven nights half board accommodation. During your stay there are two included full day excursions. The first is to the wonderful city of Granada just 45 miles away. From Almunecar you take the spectacular old road to Granada along the tropical valley of the Rio Verde passing avocado, custard apple and mango plantations. The next section crossing the sierra is spectacular. But there is surely no more spectacular setting than the city of Granada whose extraordinary Alhambra and the Generalife Gardens. As well as visiting the complex with its richly decorated palaces and luxuriant gardens, you will also have plenty of time to see the some of the city’s other attractions such as the cathedral and the old Moorish quarter of Albaicin, now a UNESCO World Heritage Site together with the Alhambra and the Generalife. Return to Almunecar is via the new motorway. The second excursion is a trip along the east coast to see the ancient city of Almeria. Almeria also has Phoenician and Roman origins and one of the greatest citadels ever built by the Moors as well as an unusual fortified cathedral constructed as defence against pirate attacks. The whitewashed walls of the old town have the unmistakable Al-Andalus atmosphere. The rest of your time is free to enjoy Almunecar. You can visit the Arab fortress built on top of a Roman castle or stroll through the delightful botanical gardens of Majuelo Park where there is a huge collection of tropical and subtropical plants, bushes and trees as well as the remains of Roman fish-salting pits. Other attractions include the exotic bird park and the network of defensive towers built by the Moors and later strengthened in the 18th century as defence against British raids. Or just stroll through the busy commercial district in the old centre where you can admire the city’s monuments – look out for the plaque dedicated to Laurie Lee who spent time here during and after the Civil War. There will also be the chance to join an optional excursion to Nerja with its magnificent Balcon de Europa and its nearby famous caves – an enormous reminiscent of an underground cathedral featuring stalactites, stalagmites and wonderful rock formations and the white-painted, hill-top village of Frigiliana. Free time until your transfer to the airport and you return flight.